The Good Place’s points system for judging the eventual worth of a human life is intentionally inscrutable and unfair—who among us hasn’t occasionally been moved to steal copper wiring from a decommissioned military base, huh?—but we’re pretty sure that surreptitiously filming your cast mates in a moment of unguarded practice dancing probably falls into the negative category. But what if that video happens to be of Ted Danson and William Jackson Harper, and they’re cheerfully flossing with each other, thus spreading lots of extra joy into our own personal worlds? 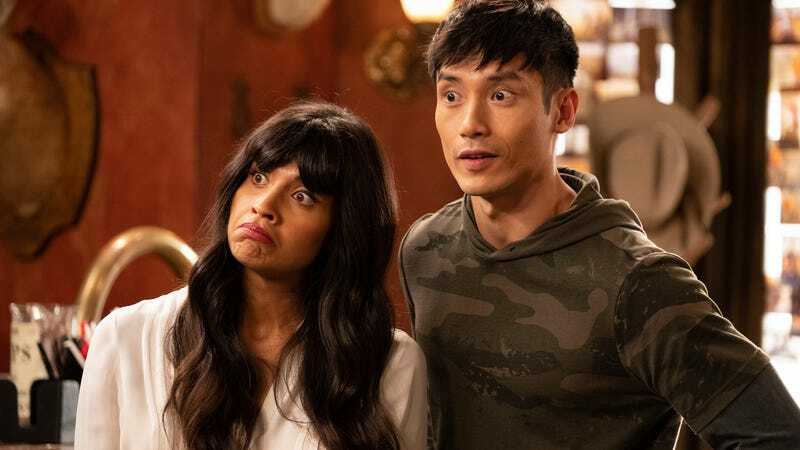 All we’re saying, Judges, is give Jameela Jamil a break, please, for her vital role as the unofficial behind-the-scenes documentarian of Good Place set antics. Jamil posted the above video to her Instagram just a few hours ago, and it’s one of those delightful little reminders that spending your days with Ted Danson is probably just as amusing as it sounds. That’s definitely the best of her videos (for now, at least), but she’s also got some top-notch Manny Jacinto goofiness for fans to enjoy, too. That’s gotta be worth a couple of afterlife points, right?